Since 2009, AAIA has been part of an Eagle Feathers Working Group (coordinated by the National Congress of American Indians). This creation of this group occurred as a response to concerns raised by tribal members practicing their traditional cultures and religions who were arrested or otherwise affected by some law enforcement stings that took place beginning in that year. 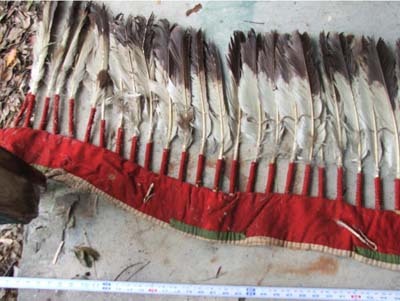 Many utilize feather and parts of eagles and other sacred birds in their ceremonies and for other cultural purposes. In response to the efforts of this Working Group, the Department of Justice issued a policy in 2012 addressing the possession and use of eagles, eagle feathers, and other affected birds by Native Americans. The policy provides that a member of a federally recognized tribe will not be subject to prosecution for possession of eagles, eagle feathers or other protected birds. It also recognizes the right of such individuals to pick up naturally molted feathers found in the wild, provide the objects to craftsman to be fashioned into objects used in tribal religious or cultural activities, give or loan to or exchange bird parts with other members of federally recognized tribes, and travel domestically with such objects (permits would be required for international travel). The Department will continue to prosecute tribal members who violate federal laws that prohibit the killing of eagles and other migratory birds or the buying or selling of the feathers or other parts of such birds. The policy is based upon the Morton Policy that was adopted by the Department of Interior in 1975. The Morton Policy refers to “American Indians”, however, and is not limited to “members of federally-recognized Indian tribes.” The Justice Department policy states that it is not intended to change law enforcement policies in regard to members of state-recognized tribes and other Native Americans, emphasizing that Department of Justice officials should utilize their discretion in determining whether to prosecute such individuals and that law enforcement priorities should be to address the sale and purchase of protected birds, and not mere possession. AAIA will continue to work with the Eagle Feathers Working Group to monitor the implementation of this policy, work towards the increasing assumption of authority by tribal nations over the use and possession of eagle feathers and other birds within their tribal territories, and ensure that members of legitimate tribes not recognized by the federal government who continue to practice their traditional cultures are not negatively impacted by the narrower language in the Department of Justice policy. ​AAIA is a not-for-profit 501(c)(3) publicly supported organization. Established in 2006 by seven of the country's leading national American Indian nonprofits, the Native Ways Federation is the only federation in the U.S. to directly serve Native nonprofits that assist Native peoples and communities in Indian Country.